The IRA blew up the Enniskillen Remembrance Day service in 1987, killing 11 people and injuring many more. An RUC officer digs into the rubble with his bare hands in the aftermath, looking for survivors. Martin McGuinness will not discuss details about Libyan links to the Enniskillen bomb because the UK claims a national security veto on its Troubles files, Sinn Fein has said. The party made the comments after UUP MP Tom Elliott told MPs in London that the Deputy First Minister could help bring clarity on the IRA Poppy Day bombing but “is not prepared to do so”. The IRA bomb killed 11 people in November 1987 and Libya supplied huge volumes of Semtex and other weapons to the IRA during the Troubles. Speaking in a debate on Libyan sponsored IRA terrorism in Westminster, Mr Elliott said he believes the Deputy First Minister could provide details on the country’s links to the atrocity - but has chosen not to. 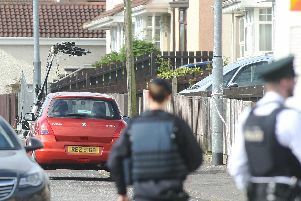 Fermanagh and South Tyrone MP Mr Elliott said: “I believe that there are people out there who could help that investigation in identifying some aspects about the weapons and support that came from Libya. Some of those people are very senior in the Northern Ireland Executive now. Indeed, I believe that the Deputy First Minister, Martin McGuinness, could give support, help and assistance, but it appears that he is not prepared to do so. The News Letter put Mr Elliott’s comments to Sinn Fein. A party spokesman agreed that “victims of the conflict and their families have a right to the truth about the past. “However, it is the British government who are causing the delay by insisting on the continued cover-up of British state murder and collusion through the use of a bogus ‘national security’ veto on disclosure. “The British government must honour their commitments from the Stormont House Agreement and offer maximum disclosure to victims and families. Earlier this week Mr Campbell said he has complained to the Police Ombudsman that the PSNI failed to interview Mr McGuinness about Bloody Sunday, even though the Saville Inquiry found he was “probably” armed with a sub machine gun and had been an IRA commander at the time.